I attended a four-week course at Rhowniar in August 1969, just after my A levels. 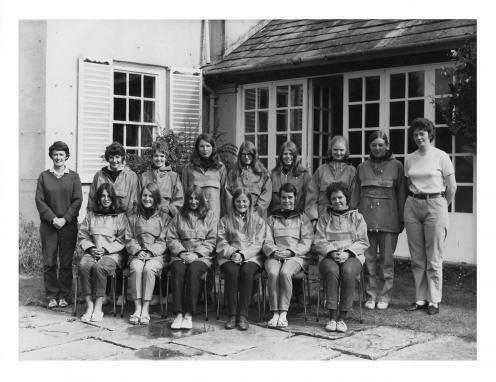 I was lucky to be sponsored by Derbyshire County Council who at that time were one of the most go-ahead authorities in the outdoor education field. In addition to that the PTA at my school bought me my first pair of walking boots to celebrate the occasion! Rhowniar was a brilliant location and I think much appreciated by most of us. The girls on our course were from a wide variety of backgrounds and ranged in age from 16 to 25 so the challenges and rewards involved in becoming a team were considerable. I still have my log-books full of typical teenage wisdom and observations, and I also have the letter written to me after the course by the then Organiser of PE for Derbyshire to whom I had to submit my log books after the course. The highlights of the course were many - but especially the five day final expedition which took us from Plynlimon, down to ford the Dyfi below Machynlleth and back to Rhowniar where my A level results awaited me. Our group came first in the competition and I believe we set a new points record. The course reinforced my love of the outdoors and of Wales, I've lived in Wales for over 30 years now and I enjoy walking, kayaking (although thankfully that has progressed from the awful old wood and canvas double kayaks we used on the course!) and sailing. The story doesn't end there though - I have two daughters who are both outdoor instructors - one of them, Alice, works at Outward Bound Aberdovey - so I still get to visit and enjoy that great environment and keep in touch with the Outward Bound world.